Home > French Blog > How To Learn French > What Level of French Am I and What French Audiobook Should I Choose? Many French students ask me: “what is my French level?”, “how can I find out my French level?” and “which one of your French audiobooks should I study with?”. I will do my best to answer these questions here. First, let’s address the question of your French level. 1 – French Test – What Level of French Am I? The main problem of these French tests is that they are written test. If you know a good free online French test which does cover these three aspects of the language, please contact me at Camille@www.frenchtoday.com and I’ll test it and if it’s good, will add it to this blog post. To truly master a language, you should not only master its grammar but also train at understanding the natives and speak back with confidence (and a decent accent). Don’t get me wrong, grammar is indeed important, especially in French, but it’s not because you can read and write French that you will be able to understand spoken French or speak French yourself. This is especially true for French: French pronunciation and even spoken French structure are very different from written French. So, with this in mind, what French learning method should you choose? 2 – How to Choose The Right French Learning Method? There are many French learning options – and I wrote an article comparing the pros and cons of French classes, self-learning French methods, immersion in France etc… I suggest you read it if you wonder how to tackle your French studies. However, unless you are a total beginner in which case this is a no-brainer and you should start with a total beginner method (I suggest my French audiobook À Moi Paris Level 1), figuring out the right level of book to study with or class to join may prove difficult. And this is the problem of most students who contact me. The other day, I received an email saying: “I don’t know which level to use… When I go for a lower French level, it’s too easy and I am bored. When I go for a higher French level, it’s just too difficult and I give up”. I meet a lot of students who have had some French before, maybe in school or in college, and can read and write OK, but have the hardest time understanding French people when they speak and freeze when they try speaking French themselves. The problem has to do I believe with the intellectual stimulation students are expecting to get out of the process of learning. From what students tell me, many of them look for something that would be challenging (so it’s interesting), yet will teach them French. I have no doubt students are able to decipher and therefore understand complex ideas and may be interested in targeting intellectually stimulating subject such as the French Subjunctive early in their studies. 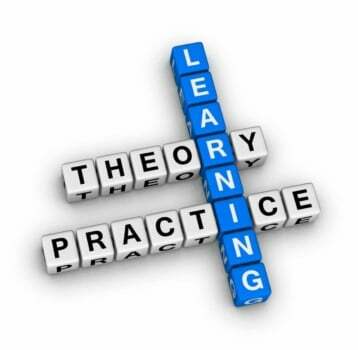 However, when it comes to languages, what is important is practicing to build reflexes to not only understand the theory of a grammatical concept but also be able to apply it automatically, without hesitating. Grammar, vocabulary, and pronunciation need to come naturally to you, without you having to think hard about it. To take an example, you may learn the theory of running, perfectly understand how to position your feet and how to control your breathing, and it will be super helpful. However, if you don’t start training by running a couple of miles regularly, you won’t be able to run a marathon. Practice does it. So, my point is slower is better. To master French, repetition is the key. Train with lower level material, repeating it until you really perfectly master all the vocabulary and pronunciation, and are able to answer the Q&A or exercises out-loud, without hesitation is the way to go. Even if it’s not really intellectually challenging. You may have understood the grammar points. Yet applying them without thinking hard about them is another story: a good example is the French adjective agreements. Many students have understood the rules and exceptions and would ace a written test. However, when they speak French, they have not mastered the pronunciation, they would not pronounce the feminine adjectives correctly, and they lack adjectives vocabulary (having often learned the same adjectives over and over in grammar books). Understanding modern French pronunciation is yet another challenge which is rarely addressed in traditional French learning method, even if they come with audio. For all these reasons, I would suggest you take a close look at all my A Moi Paris French audiobook series: on each individual audiobook page, there is a description, the table of content, and audio samples. Take the time to go through them – bottom line, only you can assess which material is actually a good match for your French level and your learning style. My audiobooks are fun to study with because they are organized around a lively story, an ongoing novel. So even if the level of French was “easy” for you, the characters are fun and the story is enticing. Furthermore, the story part is recorded at different levels of enunciation and speed, which is the missing part in the training of most French students. This will really help you understand French people when they speak and will help you get a better French accent. And for those of you that struggle remembering the different French verb forms, I suggest you check out my French Verb Drills audiobooks – audio drills and exercises specifically designed to help you gain speed and confidence with the French verb forms in only a couple of minutes per day. The Common European Framework of Reference for Languages (CEFR) is an international standard for describing language ability. It’s commonly used to describe learners’ language skills. You will find more about it on Wikipedia. French Today’s approach is unique. 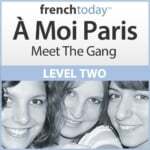 The À Moi Paris method progresses differently than the traditional methods, in particular in regard to tenses and moods. So this is not a perfect match with the CEFR. Yet it will give you a rough idea. All French Today’s French Audiobooks are only available on our site. Learning French is a humbling experience – you need to put your wits aside and accept that mastering French will come gradually: you cannot only rely on a written test to determine your level, which makes testing quite difficult! If you’re learning French to actually converse with French people, then a lot of effort should be invested in listening to level appropriate audio, and answering questions out-loud to prepare you for real spoken interactions, not only answering written questions. Grammar is indeed important, but it’s not the only aspect to study to master French. Always pick an audio-based French learning method (you need to hear the French), one which comes with samples and a table of content to see if it addresses what you need to study. And of course, it should have a 100% satisfaction guarantee, or your money back, as we do at French Today.